Markings: The front left corner of the front sight base, the well in front of the flat at the back of the front sight base, the rear of the elevator, the right side of the slider, the sear bar, sear bar safety, the top of the front toggle and the back of the rear toggle, locking bolt, the left side of the trigger, and the left sideplate are marked “40”. The flat at the back of the rear sight base is marked “Q” and “59”. The top of the front toggle is also marked with “DWM” in script. The chamber is marked “1917” at the top and “7140” on the left side. The underside of the round part of the barrel is marked “7140 / 8,82” and the front face of the frame just behind it is marked “7140 / d”. The right side of the chamber is marked with the first four characters as shown on Line 10, page 234 of “Luger Variations” by H. E. Jones for a 1914 Military Luger, with the 5th character, a sideways Eagle, on the right rear of the barrel. There is another Eagle on the left side of the breechblock. The left side of the frame under the safety is marked “Gesichert”. The inside surface of the right grip is marked “H” and “40”, and the inside surface of the left grip is marked “H”, “T”, and “40”. Sights / Optics: This pistol is mounted with a blade front sight that is dovetailed into a base on the front barrel band and has a serrated and ramped rear face. The tangent artillery rear sight is flat topped with a “V” notch and the elevator has graduated markings from 1-8. The rear sight has a fine adjustment for elevation. Stock Configuration & Condition: The grips are checkered walnut that are dark with oil staining around their edges. The checkering shows light wear without any mars. The grips rate in about Fine to Excellent overall condition. Type of Finish: The pistol is blued. The trigger, safety, locking bolt, ejector and the right side of the magazine release are straw colored. The sear bar safety is “In the White” and the sear bar spring and the pins holding the breechblock to the front toggle and the rear toggle to the frame have a fire blue finish. Finish Originality: The finish on the pistol has been professionally restored by Ted’s Luger Strawing Service of Rio Rancho, New Mexico. Bore Condition: The lands are gray and the grooves are dark. The rifling shows light wear. There is light erosion in the grooves the length of the bore. Overall Condition: This pistol retains about 99% of its current finish. There are a few tiny marks under the finish scattered over the surfaces with thinning on the edges of the stock lug and the bottom of the backstrap. The serrations on the toggle knob are sharp and the knurling shows light wear. The knurling on the magazine release and locking bolt is sharp and the serrations on the safety show light wear. The grip screws are sharp. The markings are clear and those on the barrel are crisp. 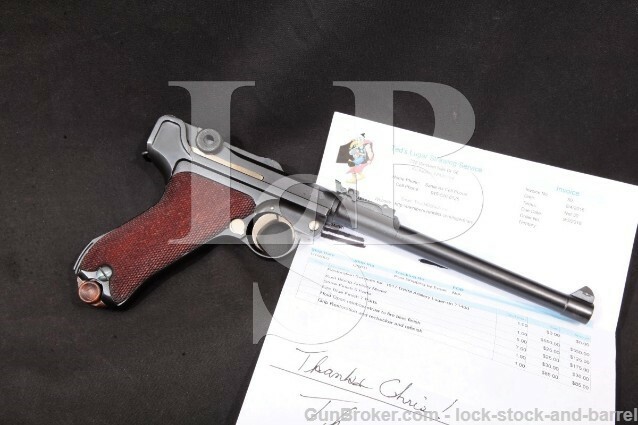 Overall, this gun rates in about Fine-Excellent condition as professionally restored. Mechanics: The action functions correctly. The barrel and receiver are tight to the frame. We have not fired this pistol. As with all used firearms, a thorough cleaning may be necessary to meet your maintenance standards. Box, Paperwork & Accessories: This pistol comes with a total of one magazine with a tin-plated finish and a wooden bottom piece marked “203 / b”. The magazine shows light wear with a few tiny spots through the finish and there are a few tiny marks in the bottom piece. The magazine is in about Fine condition. The pistol also comes with a receipt from Ted’s Luger Strawing Service of New Mexico for the restoration work done on the pistol. Our Assessment: This Artillery version of the Luger pistol is also known as the “Long Barrel P.08”. It was the first Luger to use the 32-shot snail magazine. Many of the Artillery Models were equipped with “Fine Tuning” front and rear sights, which were auto-calibrating for windage drift due to bullet spin, making them second to none in long range accuracy. This pistol is a Model 1914 DWM Artillery Luger made in 1917. It has matching serial numbers on its parts but the magazine is from a different pistol. The markings are all correct, and those on the barrel are sharp. This pistol is in about Fine condition as professionally restored, with about 99% of its current finish remaining. The bore is gray/dark with light wear in the rifling and light erosion in the grooves. The artillery models are always collectable: they are a very interesting looking weapon that almost everyone wants to own, and there were far fewer of them than the other Luger variations. This pistol looks fantastic and will display well, so please check-out our pictures. This pistol has the fine-tuning rear sight, which makes it all the rarer, as all artillery models were not so equipped. CA Legal or CA Private Party Transferable: This C&R eligible pistol CAN be transferred in California and CAN be sold to a California resident as a private party transaction at our shop in Simi Valley. All cartridge firing handguns (even C&R’s and antiques) sold to a California resident must be DROS’d. This does not apply to out of state buyers.